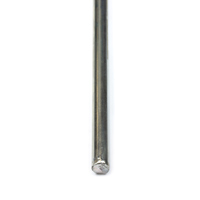 This electro-galvanized iron rod is used as a head rod in various awning configurations. A useful component for awning fabricators, this awning iron won’t break when bent at right angles. The zinc plating resists chipping and flaking, even while being bent. Use in the head of awnings, and for marine and tonneau covers when using aluminum awning rail. Fitted for pipe-threaded frame fixtures, the rod easily inserts into a pocket sewn at the top of the fabric. 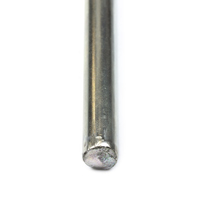 It can also be used for tie down bars, lacing, and in conjunction with head rod molding. Also available in fiberglass.